President Donald Trump speaks during the National Prayer Breakfast, Feb. 8, 2018, in Washington. President Donald Trump has been getting a bump up in the polls in recent days, likely thanks to growing public optimism about the U.S. economy. The latest Quinnipiac University poll has President Donald Trump's approval rating at 40 percent, his best showing in seven months in that survey. The Gallup weekly tracking poll also had Trump at 40 percent. The last time that happened was mid-September. The Real Clear Politics polling average now has Trump at slightly above 42 percent, a notable change after months of weak readings in the mid to high-30's. But political analysts have been quick to caution any presidential progress in the polls could be undone by continuing attacks aimed at opposition Democrats and the ongoing investigation into possible collusion between Russia and Trump's presidential campaign in 2016. 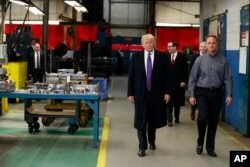 President Donald Trump participates in a tour of Sheffer Corporation during a visit to promote his tax policy, Feb. 5, 2018, in Blue Ash, Ohio. Trump took his economic message to a factory in Ohio recently where he highlighted the impact of his tax cuts. But the president also took a swipe at Democrats who withheld their applause at his recent State of the Union Address. "They were like, death, and un-American, un-American.Somebody said treasonous. I mean, yeah I guess, why not? Can we call that treason? Why not?" he said. It was a sharp deviation in tone from Trump's recent address to Congress where he raised the prospect of bipartisanship. "I call upon all of us to set aside our differences, to seek out common ground and to summon the unity we need to deliver for the people," a line that generated applause in the House chamber. Trump's slightly improving poll numbers suggest voters are beginning to give him some credit for the surging economy. But the attacks on Democrats could undermine his efforts to reach out and broaden his base of support beyond Trump loyalists. "You know, if Trump is smart he will try to move to the center and make deals with Democrats," said Jim Kessler of the center-left advocacy group Third Way. "But they have not shown an ability to go more than a week without some disaster occurring. So until they are able to string a couple of weeks together, I expect chaos." FILE - Special Counsel Robert Mueller departs after a closed-door meeting with members of the Senate Judiciary Committee about Russian meddling in the election and possible connection to the Trump campaign, at the Capitol in Washington, June 21, 2017. 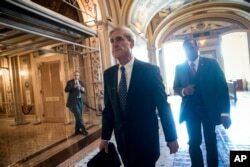 Trump and some of his Republican allies in Congress also continue to complain about the Russia probe.Dueling Republican and Democratic staff memos have sharpened the divide over whether there was any political motivation to initiate the investigation into Russian election meddling.But Democrats see that as a concerted effort to undermine the investigation led by special counsel Robert Mueller. "They do not quit with all these conspiracy theories, with all these ridiculous fomentations," said Senate Democratic leader Chuck Schumer this week. "They do not quit, perhaps because they are afraid of what a real investigation, which Mueller is doing and will continue to do, will reveal." The Mueller probe shows no signs of ending anytime soon and the longer it looms over the administration, the more it could become a factor in the November midterm congressional midterm elections. "That does overhang his presidency," said John Fortier with the Bipartisan Policy Center in Washington." We do not know the timing.We do not know the revelations that will come out and it could be a big bombshell one way or the other as we proceed this year." Presidential approval ratings can have a big impact on midterm voting. The party that holds the White House traditionally loses congressional seats in midterms, and those losses are magnified when the president's approval is under 50 percent. In Trump's case, he has struggled throughout the first year of his presidency to stay near 40 percent, and that has a lot of Republicans worried about their chances to hold their majority in the House of Representatives. Democrats need to pick up 24 seats in the House to retake the majority. Republicans hold a 51 to 49 seat edge in the Senate.But Democrats are defending 26 of the 34 seats at stake in the November election and ten of the seats they hold are states that voted for Trump in 2016. Another good indicator for the midterms is the generic ballot question where voters are asked which party they would prefer to represent them in Congress. Democrats currently have an edge on that question over Republicans by about six points, according to the Real Clear Politics average of several surveys. But that is down from a double-digit Democratic advantage in December, suggesting the strong economy and the slight uptick in Trump's approval rating might be helping Republicans.